The long-lost fraternal twins of the citrus world, Meyer lemon and Key lime spotted each other across the fruit bowl and the rest is history. At turns sweet and tart, Ener-C Lemon-Lime is the ultimate refreshing duo, powering up even the pokiest of palettes (and the occasional scratchy throat) with its delightful zing. Cane fructose, Citric Acid, Malic Acid, Sodium Bicarbonate, natural Lemon-Lime flavour, natural Lime Flavour, Tapioca Maltodextrin, Silicon Dioxide, Glycine, Aspartic Acid, Quercetin Dihydrate powder, Tartaric Acid, Cysteine HCl, Lemon pulp powder. Below are reviews of Lemon Lime Vitamin C Drink - 30 Sachets by bodykind customers. If you have tried this product we'd love to hear what you think so please leave a review. The long-lost fraternal twins of the citrus world, Meyer lemon and Key lime spotted each other across the fruit bowl and the rest is history. 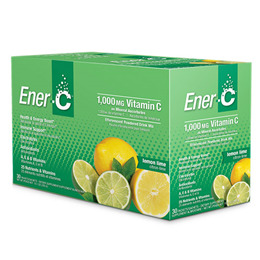 At turns sweet and tart, Ener-C Lemon-Lime is the ultimate refreshing duo.